I haven’t written much on this blog recently and so I thought it might make sense to just list – and link to – a couple of the projects that I’ve been working on during the last year. This way there are at least some things to read or watch for those who come to this page. What kept me busy mostly was the work on Our World in Data, the free online publication on global development that I started some years ago. Unfortunately quite a lot of time I spent on the search for funding. But there were also a lot of very positive developments! The publication grew quite a bit – we now have 87 entries on Our World in Data! You find them all listed on the landing page. The very long and quite detailed entry on global extreme poverty that Esteban Ortiz-Ospina and I wrote. The still growing entry on yields and land use in agriculture that Hannah Ritchie and I are still working on. Jaiden Mispy, the web developer in our team, keeps making our own open source data visualization tool – the Our World in Data Grapher – more and more useful. Aibek Aldabergenov, our database developer, made it possible to access large development datasets directly (without uploading them manually) and that made the work of the authors much faster and more fun. And while I wasn’t active here on my personal blog, we actually now publish very regularly on the OWID-blog. My most widely read article in the last year is ‘The Short History of Living Conditions – And Why it Matters that We Know it’. But the biggest change for Our World in Data in the last year is for sure that we are now working as a team. And everyone in the team is really awesome and I’m really, really happy to be working with all of them! Felix Pretis and Max Roser (2016) – Carbon Dioxide Emission-Intensity in Climate Projections: Comparing the Observational Record to Socio-Economic Scenarios. In Energy Volume 135, pages 718–725, September 2017. Available as an open-access publication at the journal’s website here. Sterck, O., Roser, M., Ncube, M., Thewissen, S. (2017) – Allocation of development assistance for health: Is the predominance of national income justified?. In Health Policy and Planning – forthcoming. 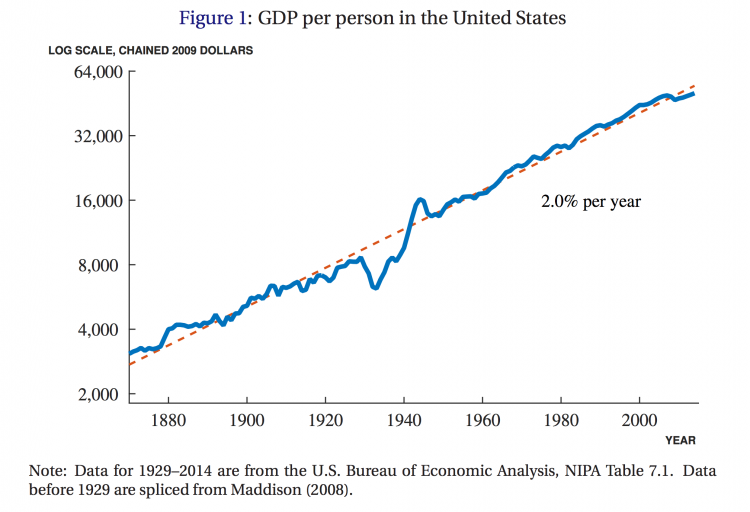 Nolan, B., Roser, M., Thewissen, S. (2017) – GDP per capita versus median household income: What gives rise to divergence over time? In Review of Income and Wealth – forthcoming. Together with Sir Tony Atkinson, Joe Hasell, and Salvatore Morelli, I published the new version of the Chartbook of Economic Inequality. The Chartbook aims to bring together the data on several dimensions of inequality for 25 countries over the period since 1900. Version 1 of this was published in 2014. And in May this year we published a major revision of this work. The US lags far behind its peers on “inclusive” economic growth – with Stefan Thewissen; Vox; February 2017. The very saddest changes in the last year were the deaths of Sir Tony Atkinson and Hans Rosling. Tony died on the first day of this year. He brought me to Oxford, he helped to develop the ideas I am now working on, and he was just the kindest, smartest, and most generous mentor one could wish for. That was not only true for me, at his website I collected a long list of obituaries that speak for themselves. 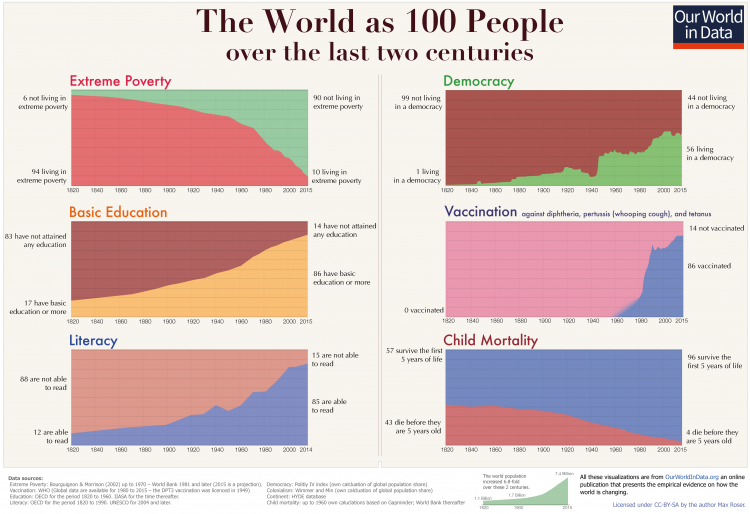 On Our World in Data I have just published a history of living conditions. 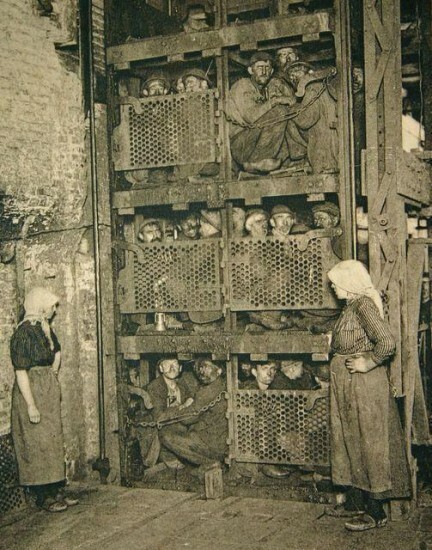 The source of this image and the background story is here (in Italian). Average working hours in Belgium back then were 64 per week.